Event Description: Lights * Camera * Action! 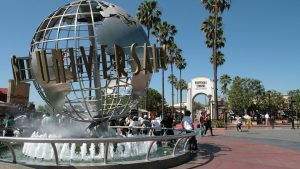 The film is rolling for Dr. Clue’s Universal Studios adventure in Hollywood, CA. Perfect for corporate teambuildng events and conference offsites, your treasure hunt at Universal cuts from re-creations of city streets in London & Paris to a back-lot tour of movie sets, past and present. ***BRAND NEW: Harry Potter-related clues that bring the Wizarding World of Harry Potter alive! During your corporate teambuilding treasure hunt… expect to encounter: Transformers; Jurassic fossils; the Simpsons, movie stars and of course, Harry Potter and much, much more. Admission not included in program fee. Gather at Front Gate of Universal Studios.